Developed by an internationally renowned doctor and oral surgeon, CanaGel™ was designed to be simple, convenient and effective. The innovative, patented technology used in CanaGel™ makes it the top choice in the CBD oil market. Laboratory tests show up to 100% of phytocannabinoid-rich hemp oil was virtually absorbed in vitro in just 5 minutes. Naturally occurring phytocannabinoids are an important class of compounds found in hemp. That’s why in CanaGel™, we always use full-spectrum CBD oil—derived from specially cultivated hemp. As a result, you don’t miss out on the positive traits that hemp phytocannabinoids have to offer. They’re all in there! Phytocannabinoids are an excellent source of essential vitamins, minerals, Omega-3 fatty acids, flavonoids, chloriphyll, and terpenes. It makes up more than 90% of the phytocannabinoid content in hemp oil and is non-psychoactive. And there’s another crucial effect of using the full spectrum of hemp oil in CanaGel™. All the phytocannabinoids interact with the body’s endocannabinoid system, located in the brain and every other organ system to help influence all physiological functioning in the body. In 1999, Dr. Raphael Mechoulam, perhaps the top researcher in this field, and others dubbed it the “entourage effect.” Simply put, phytocannabinoids in hemp are much more effective when they’re working together than if they were consumed separately. As with all botanical products, the sum of their active ingredients is more beneficial and effective than any one single component – no different when it comes to the class of phytocannabinoids in hemp. You already know the many benefits of CBD oil. But what’s the best way to obtain that nutrition-packed hemp oil on a daily basis? 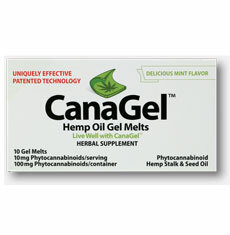 We’ve developed an exciting new alternative to the existing oils, capsules, edibles and chewables — CanaGel™ Hemp Oil Gel Melts. Our team of doctors created this unique patented technology in order to provide full spectrum phytocannabinoid-rich hemp oil to your system. It couldn’t be easier or more convenient — simply allow the gel melt to slowly dissolve in your mouth, then swallow to obtain maximum results. Independent lab results confirm that after 2.5 minutes of contact, 80% of phytocannabinoids were absorbed in vitro, and after just 5 minutes, virtually 100% of the nutrient-rich phytocannabinoids were absorbed. Directions: As an herbal supplement, place CanaGel in your mouth. Let the gel melt slowly, then swallow. For the most comfortable placement, we suggest placing melt inside of your cheeks. Storage: Keep at room temperature. Store away from excessive heat and humidity. Warning: Do not take this product if you are pregnant or nursing. Consult your healthcare provider if you have any medical conditions or are taking any medication. Use only if the foil seal is intact. Keep out of reach of children under the age of 18. Discontinue use if adverse reaction occurs.